Hi, yesterday we did the 2.5 hours cruise with Sean as our guide. We were returning customers having done the same cruise last year. We had a visitor up from down south and in terms of value for money, amount of wildlife seen, and expert commentary and knowledge, this is by far the best cruise available in the NT. Sean really took care of us and stopped at every opportunity to show us what was on offer. Would recommend it to all locals and visitors alike. This cruise was the best part of our holiday in Darwin, the most natural, relaxing 2.5 hours, the tour guide kept us informed about everything we saw from the time we got on the boat, we were seeing everything as natural as could be, crocodiles, birds, flowers & one of the staff on his day off fishing showing us his Barramundi he had just caught. To top it all off a BIG lunch which was eaten in the most tranquil place on earth not a sound apart from the wildlife.This is a must do when in Darwin. Hi,on the 15th of May did your tour [4 of us] with guide Tony.thoroughly enjoyed it particularly lunch with the saltie.Tony spent a lot of time making sure every one got their monies worth.A great guy.Lunch was also great,fresh and plenty of it.Will have no hesitation pointing our mates in your direction. This is the best cruise we have ever done. It came recommended to us from heaps of people while we were travelling. I now understand why they told us not to miss it, it was amazing. Great wetlands, birds, crocs, lilies and the guide was fantastic. Thanks for a wonderful experience. Saw plenty ofcrocs and just thoroughly enjoyed the picturesque wetlands. It was amazing. 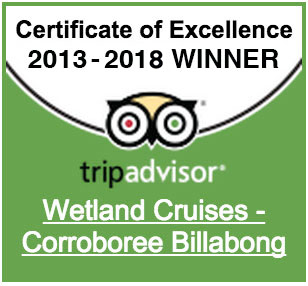 We did a cruise at Yellow Water in Kakadu and the cruise at Corroboree Billabong was not only better but it was also much cheaper. Dont change a thing. Thankyou. Great cruise and fantastic guide. Saw heaps of birds and crocs. Just awesome. Excellent cruise, guide was great. Very interesting, not only for birds and crocodiles but also the plants. The lilies were beautiful. The pink lilies were amazing, thousands of them. Cruise was fantastic with birds, crocs and plenty of room on the boat. What a bloody awesome cruise, thanks for a great day. How wonderful it was to have such a passionate tour guide to show us this beautiful land. Thankyou. We saw heaps of crocs and other wildlife, thanks a lot it was fantastic. Fabulous Experience, Lots of Lilies, birds and crocs. Highly recommended. The guide was great, very informative. We loved the sights. Wonderful Trip. More birds than i have ever seen. A fantastic cruise, enthusiastic guide, fabulous wildlife. Fantastic!!! Informative, Interesting and saw heaps of birds and crocs. Fabulous cruise. Perhaps what we enjoyed the most was how deeply attached the guide was to the wetlands. Best trip/tour ever - absolutely beautiful. We had an amazing 2.5 hour trip. 20+ crocs, Jabiru, Brolga,Jacana, Whistling Ducks. Oh, What a trip! Best thing we have done in the NT. Loved Ted as our guide. Most wonderful day, new adventure. Dont miss it! The best tour we have done in 3 years of travel. Fabulous, informative, beautiful - Nature at its best. Best Value for money wetland cruise. Lunch fantastic. Best money we have spent in a long time, we thoroughly enjoyed our time with you. Best hour we have spent on our whole trip, thanks guys. Fantastic 2.5 hour wetlands trip - "Gold Star". Great birdlife, lunch, crocs - excellent. Magic wetlands and cruise. Dont miss this experience. Excellent cruise. Lots of birds, crocs, great guide, delicious lunch. Fantastic!! The guides love of animals/environment shone through. Wonderful. Best cruise yet, fabulous. We have told everyone about you. Greatest trip of my 12 month holiday. Wonderful!! Loved all the birdlife. Great lunch too. A truly magical experience on so many levels, awesome guide, great tour, more than your monies worth. Thank you. I will be recommending this place to everyone, unbelievable experience. The best excursion we have had in 3 weeks here, fantastic!! It was just beautiful, amazing birdlife and a very informative guide. You are doing a great job, thankyou. Just got off the boat! Great trip and thank you for all the amazing photos! Thanks for a great trip! Just wanted to say that I had a great time on this boat cruise last Monday. Amazing amount of birds, crocodiles and wildlife! Was definitely one of my highlights in Australia.